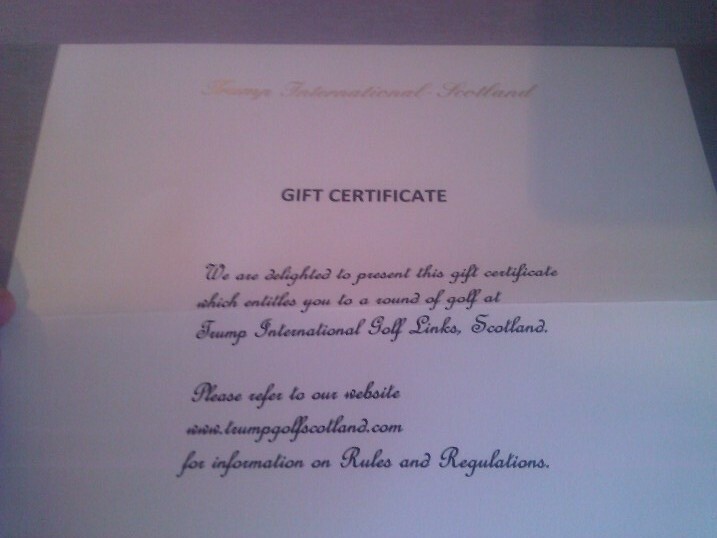 A round of golf on Donald Trump’s new Golf Course, “Trump International Scotland”. NOTE: Below you will see a gallery of some of the photos that I took on the day. Well, the 27th July 2012 finally came round, and my dad, my sisters boyfriend, his dad and myself, headed for Trump International. You have to give Donald Trump credit, he certainly knows what he is doing. The drive up to the Golf Course is spectacular! Once we were all signed in, we took advantage of the driving range, and pitching/putting area, which not to put to fine a point on it, are in better condition than some actual Golf Courses that I have played! It was then time to head out on the course. We were greeted at the first tee by the starter, who pointed us in the right direction, and explained which tee we should be playing off. For us, it was the Green tees, since the white tees were closed, and the Blue tees were only recommended for single handicappers, which we aren’t, not by a long shot. He did recommend that we take a look at the views from some of the Black tees, which we did, and all I can say is, they are amazing! You can see some of these below. Granted, we did get an amazing day for playing the course. The sun was out, and there was very little wind. This definitely helped the scores, and the number of lost balls count. On any other day, the narrow fairways, elevated tees, sandy fairways, deep bunkers, and fast greens, would not have been so forgiving! All in all, we had a fantastic time, and I would highly recommend playing this course. There are still some areas where the course needs work, and time to bed in, but that will come with time. Congratulations to Donald Trump for bringing a great Golf Course to the North East!